“A material that is harder than diamond has been created in the lab, by packing together tiny "nanorods" of carbon. Hurricane Katrina about to turn north and hit New Orleans. “ "It was fully recognized by officials that we had Category Three [hurricane] level of protection," Strock said. "As projections of Category Four and Five were made, [officials] began plans to evacuate the city. On landfall near New Orleans (Mississipi river mouth), there was a storm surge of at least 20 feet / 6 metres. New Orleans is, on average, 6 feet / 2 metres below sea level, protected by a netwok of levees (dykes / dams). Awesome AVI loop of Hurricane Katrina from 25 to 29 August [20Mb RealPlayer download]. A very impressive film made by the Mars Rover Spirit when it reached the top of the 82m-high Husband Hill in Mars’s Gusev Crater, after 14 months’ laborious climbing. The journey took so long because the slope was steep, requiring zig-zagging and even retreats until a feasible route was found up to the summit. 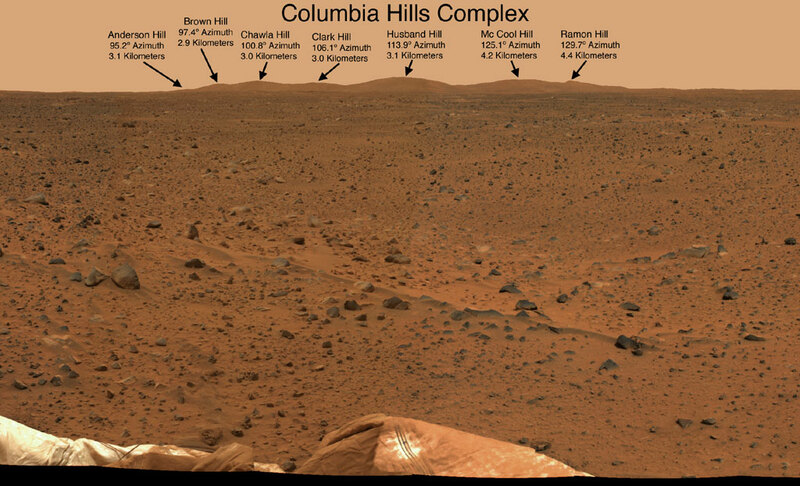 Husband Hill is one of the seven neighouring Columbia Hills [image link], named after the crew of the Columbia space shuttle. Where are the Rovers now? gives maps showing the Rovers’s travels and links to simulated videos of Spirit’s journey. “An international team of scientists, led by researchers at the University of Washington in Seattle, Washington University and the Broad Institute (MIT/Harvard), is currently comparing the chimp and human genome sequences and plans to publish results of its analysis in the next several months. Interactive graphic showing some diffences between humans and chimpanzees. robot jockey in a camel race. click credit link for more, larger images. The jockeys are controlled by remote-control in similar fashion to flying model aeroplanes. All we need now is robot camels. This development builds on naval work with high-speed torpedoes form a gas bubble ahead of travel to reduce friction. Claims are that the new bombs will do likewise with earth and concrete, allowing them to penetrate up to ten times further into the ground. “Lockheed Martin hopes the supercavitating bombs will reach 10 times the depth of the current U.S. Air Force record holder, the huge BLU-113 bunker buster that can break through nearly 25 feet (7 meters) of concrete or nearly 100 feet (30 meters) of earth. “The celestial collision and ensuing data collection by the nearby Deep Impact mothership was the climax of a very active 24 hour period for the mission which began with impactor release at 2:07 a.m. EDT on July 3. Deep space maneuvers by the flyby, final checkout of both spacecraft and comet imaging took up most of the next 22 hours. Then, the impactor got down to its last two hours of life. The precision of the the target-hitting was described as “like [a] mosquito hitting a 747” except it “didn't splat on the surface, it's actually gone through the windscreen”. This degree of accuracy could offer a solution to rogue meteors charging our planet. Send out a Deep Impact-type craft loaded with a nuclear device. That impact could destroy the approaching meteor, or at least deflect its course.